Are you impresses with what you see here? 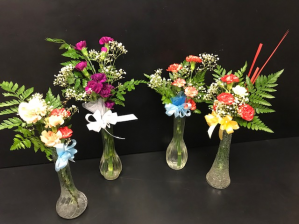 That's right folks these vase arrangements were crafted by your peers! 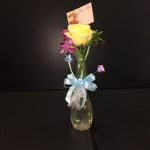 These arrangements are perfect for any occasion such as birthdays, ceremonies, or to simply just spruce up your house. State your desired colors for flowers and ribbon and let us do the rest! Starting at $15, order your personalized vase a week in advance.